You pride yourself on making great websites. But are they really? Odds are that every day someone can’t use your site because of physical limitations. Maybe he can’t hear the informative tutorial that brought him to your site in the first place. She may not be able to fill out forms that she needs to because they’re not screen reader-friendly. Because he has a visual deficit, he can't read your well-written content—there’s no distinguishing your subtle light grey text from your charcoal background. Or maybe she can’t navigate your menus because using a mouse is not an option. How great is your site for her? • You don’t know how and don’t think you have the time to learn. 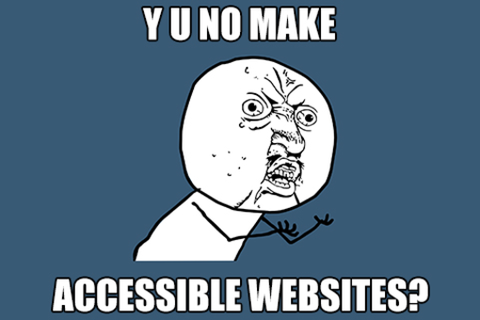 • People with disabilities don't need to use your site. • Your client doesn’t want to pay for you to fix it and your PM says you don't have time for it. • The site's design will suffer under the constraints of accessibility standards. • You can't use any client-side scripting or multimedia if the site is going to be accessible. But you've been misled. Making your site usable for everyone is one of the simplest—and most important—things you can do. So take pride in your craft and make sure everyone can appreciate what you put out there! In this workshop, which is specially tailored for developers, designers, and project managers just getting started with accessibility, we’ll look at, with some levity, the barriers your disabled users encounter, the roadblocks you face to be inclusive, and simple ways to address them. Don’t worry if you don’t know the difference between 508 or WCAG. We’ll demonstrate how even the best sites aren’t meeting these standards and walk you through the fixes. We’ll show you how inaccessibility affects people in real life, help you figure out how to get buy-in from your other stakeholders, and give you the tools to make accessibility happen on your site. - Knowledge of HTML and CSS will help you but anyone involved in development life cycles will benefit. - Bring something to take notes with and leave behind everything you think you know. Carol has been an interactive producer at Sherry Matthews Advocacy Marketing for two and a half years but has been involved with government-related web projects since the early 2000’s. For the last two years, Carol has been actively involved with her company’s accessibility initiatives. She works closely with designers and developers to not only make sure standards are met, but that the user experience is positive regardless of how the user is accessing the information. While she doesn’t consider herself an expert in accessibility, she has a lot of experience helping teams resolve conflicts and finding creative ways to work often-overlooked requirements, like usability and accessibility, into project plans. Susan Hewitt’s first experience with the inaccessible Web was in 1995 when a visitor to her Brontë sisters fan site complained it was unreadable because the color of the text was too close to the color of the background. This complaint went unheeded however because Susan thought her color palette looked good; as did the flashing banner on the splash page. Fast forward past many IPOs and pixel-perfect table layouts and Susan found herself building sites at the University of Texas. Here she was introduced to the importance of making the web available to everyone. After that, her webmonkeying found new purpose in accessibility. Since then, Susan has evangelized accessibility across several state agencies. She specializes in bringing people into compliance while convincing them it was their idea to begin with. Her hobbies include analyzing every website she visits to see if it’s accessible, mapping WCAG standards against Section 508 standards, and stopping strangers on the street to show them the accessibility features of her iPhone. One day she hopes to find that Brontë site visitor from 1995 and formally apologize for the insufficient color contrast.